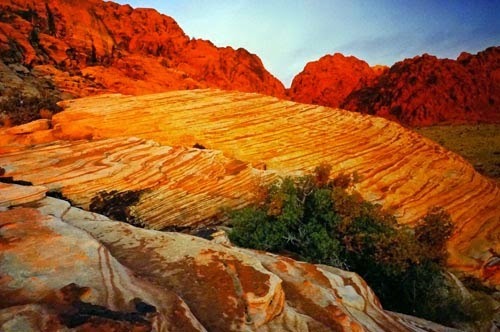 Red Rock Canyon, home to the Red Rock Escarpment, a 3,000 foot-high mass of multicolored pinnacles and boulders jutting from the canyon floor. It's also home to more than 45 species of mammals, about 100 species of birds, 30 reptiles and amphibians, bighorn sheep, coyotes, feral horses, burros and an abundance of plant life. From Las Vegas, travel west on Charleston Boulevard, which will become State Highway 159, to the Red Rock Canyon entrance.